Who is next hacking target in 2015? Hospitals? Author tonyzPublished on December 24, 2014 March 17, 2015 Leave a comment on Who is next hacking target in 2015? Hospitals? 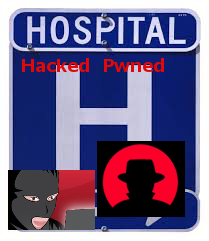 http://money.cnn.com/2014/08/18/technology/security/hospital-chs-hack/ CNN story of 4.5 mil records of Community Health Systems - why would hackers want these records? Because the records have ss#, names and addresses.
" But this time, the hackers stole patient data instead. Hackers did not manage to steal information related to patients' medical histories, clinical operations or credit cards. " The patient data is supposedly protected by HIPAA, but it is only as good as the hospital network overseers. Then it does not matter... One has to have a Security policy with stringent controls, physical and electronic. Wireless and wired, Internet and corporate network, Cloud and office. It must all work towards the goal of protecting your data. Published on December 24, 2014 March 17, 2015 Categories company news, security newsLeave a comment on Who is next hacking target in 2015? Hospitals? Here is one of the latest on http://fortune.com/2014/12/20/sony-pictures-entertainment-essay/ the Nork story. http://oversitesentry.com/digital-security-in-risk-assessment/ Here is where the current environment is assessed, including the new 25 Billion Internet of things to come on line in the next year. Do you really think the world will get less dangerous? A backdoor is when software runs a piece of code that you are not aware of, and so CoolReaper phones seem to have malware built into the phones, which unknowingly install apps on their own. The Tip of Day has a segment on the Red team versus Blue team concept as well as what scanning consists of in the OSI layer representation of the network stream. We perform Alpha scans and Sigma scans and where they consist in the OSI layer. Contact us for help scanning your computers and network. Here are some startling statistics. "It won't happen to me" Mr. Ostrich says as it buries head in sand. We can help with a new cyber strategy for 2015. Hopefully they will review the security implications of this development. At the tip of Day segment - we are reviewing what the red team does in the security of the network. They test the network defenses by uncovering vulnerabilities - hacking in, and then exploiting the penetrations. SVAPE&C Scan , Vulnerability Assessment, Penetrate - Exploit & Control. We can help you by acting as your red team tester.